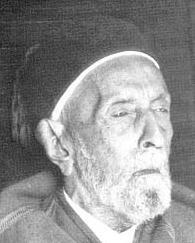 Mohammad Idris was born in al-Jaghboub, Libya in 1890. His father Sayyid al-Mahdi al-Sanousi was at that time the head of the Sanousi order. His mother is Aisha al-Bousaifi. He said "... I wrote to Sayyid Ahmad, who was then in al-Dakhla in Egypt, to inform him of this and he replied agreeing to come to terms with the British but not with the Italians." Idris held peace negotiations with British and Italian representitaves in al-Zwaitena which were broken off in early October 1916. Late 1916 Idris again contacted the British asking for resumption of negotiations. The negotiations took place in January 1917 in Akrima [near Tobruk.] Idris continued his contact with the Italians [especially after Ahmed al-Sherif was forced to leave the country and live in exile in Turkey]. In November 1920 the negotiations between Idris and the Italians calminated in the signing of the Treaty of al-Rajma. The leading provision of that treaty wa s the the recognition of Idris as the Sanousi Amir of the autonomous administration of the oases of al-Jaghboub, Aujila, Jalu and al-Kufra. The Amir received a personal monthly allowance and annual allowance for general general expenses and some monthly allowance for members of his family. Soon after this, the Amir was invited to pay an official visit to Italy. In November 1920 Idris left Benghazi to Italy on an Italian destroyer. 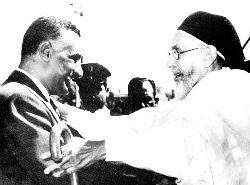 He was accompanied by Omar Pasha al-Kikhia, Shaikh Abdulazeez al-Issawi, Shaikh Ehmaida al-Mahjoub, Mohammad al-Fazzani, Ali Pasha al-Abdiya, Sharif al-Gheriani, Hassan bu Khadra, Abdulqader Farkash, Mohammad al-Saqisli and Ibrahim al-Shalhi. Faced with the refusal of the Cerinaicans to abandon their arm struggle against the Italians [in Bou Mariam Idris promised the Italians to disarm the tribesmen] and the insistence of the Tripolitanian leaders that Tripolitania should be an Emirate under Amir Idris [which the Italians refused to accept], the Amir left Libya for Egypt on the 30th of November 1922. From 1922 till 1931 Omar al-Muktar lead the Libyan resistance against the Italian occupation till he was captured and hanged on the 16th September 1931. Amir Idris came back to Libya afer the end of World War II [during which he established the Libyan Arab Force which fought on the sides of the allied forces] where he became the Amir of Cerinaica till 24 December 1951 [Libya's Independance Day] when he became the king of Libya. King Idris lived in exile in Egypt till his death on the 25th of May 1983. Reference: "The Life and Times of King Idris of Libya" by E. V. A. De Candole. Published by Mohamed ben Ghalbon, 1990.